Oh, yeah. The whole display turned out really well! Simple to do, but fabulous outcome! Ummm...do you have a guest bed down in that cold storage room?? I don't think the cold would be a problem after a little while! Your new labels are definitely better. Fabulous score and wonderful sister-save. I kind of think that chocolate orange port sounds lovely. Or maybe the golden strong ale. Love this project! I love the look of chalk on chalkboard! Rustic, simple and perfect. I'll bunk down with Danni. We can snuggle to keep warm between sips of beverage. I notice the only thing I knew "Gewürztraminer" was empty. I swear I didn't drink all the bottles! Okay WAIT. 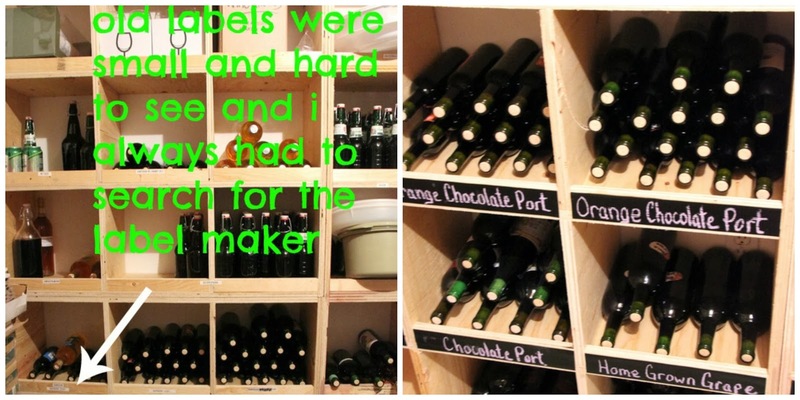 You have your own wine cellar??? That's it. I'm moving in to your dormer room post haste. I hope there's a fireman's pole that lands directly in the cellar. Oh, and I also have that coaster, but mine says, "how classy people get shi-----ed." You get it. Wow, WOW that's it, you're having big company! Love the new labeling system, the wine cellar and of course your pictures, so pretty! Oh my goodness -- that is some wine storage you have there! I want to come for a tasting, & I'll bring the cheese and crackers!